We are happy to announce a partnership with Cloudbase Solutions for bringing Windows support in Juju and MaaS. During the keynote of the OpenStack Summit in Atlanta we presented OpenStack integration with Hyper-V as well as Active Directory, SQL Server and SharePoint Juju charms, providing a clear idea of the huge potential of this partnership. Based on this collaboration, it will soon be possible to orchestrate Windows based deployments at any scale in an amazing way. Juju charms represent a way to define deployments and relationships between services and applications. The following screenshot clearly shows how easy it is to create a SharePoint server deployment with Juju, by simply defining relationships between Active Directory, SQL Server and SharePoint. 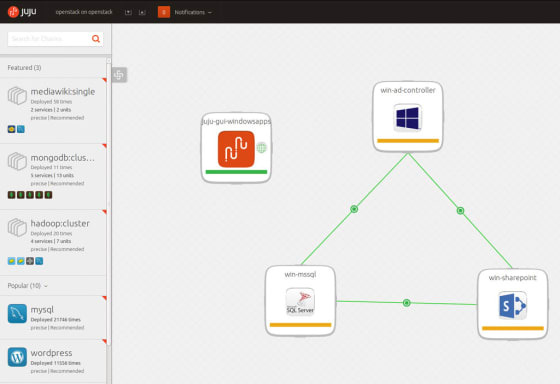 Using Juju to simply define relationships between Active Directory, SQL Server and SharePoint. The charms will support load balancing, clustering, SQL Server mirroring and other HA solutions, as fault tolerance and scalability are a top priority. They will support bare metal deployment as well as OpenStack virtualized deployments on any supported hypervisor, including KVM and Hyper-V.
OpenStack virtualized deployments on any supported hypervisor, including KVM and Hyper-V.
We are also introducing Microsoft Windows bare metal deployment in MaaS, ranging from Windows Server 2008 up to Windows Server 2012 R2, including Hyper-V Server versions and all supported workstation operating systems, with Windows 7, 8 and 8.1 providing great value for VDI scenarios. As a next step, we plan to work on mixed deployment scenarios, with both Windows and Linux (Ubuntu, CentOS), defining a whole new way to orchestrate enterprise workloads.